Only Ganesha idols made out of clay should be used as they dissolve in water easily. If a colourful Ganesha idol is being purchased during the festive season, then it should be painted with natural dyes. Dyes are available in many places across the state. The immersion of idols pollutes water bodies. 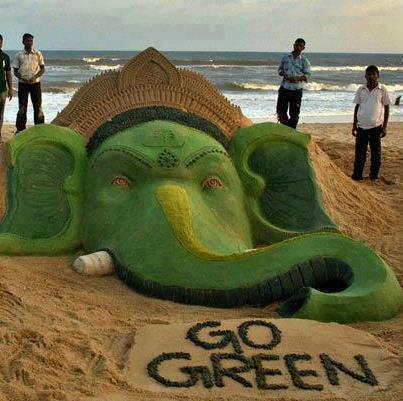 To reduce pollution, Ganesha mandalis could retain the same idols and exchange them with other organisations every year. This will ensure the usage of existing idols without polluting the water. Such a trend is already taking place in Pune and Mumbai. Instead of using drinking water, the people should immerse idols in pushkarnis and other places specified by district administrations. Immerse idols in buckets of water. Before the immersion, remove all decorative items, like flowers, plastic, garlands etc. Do not immerse idols in rivers, lakes and wells. Avoid using plastic decorative items. Use natural leaves, plants and flowers. People should control the use of crackers which cause noise, air pollution and generate solid waste. Avoid blaring music from loudspeakers or organising orchestras. Sound pollution causes extreme discomfort to the elderly, patients and infants.